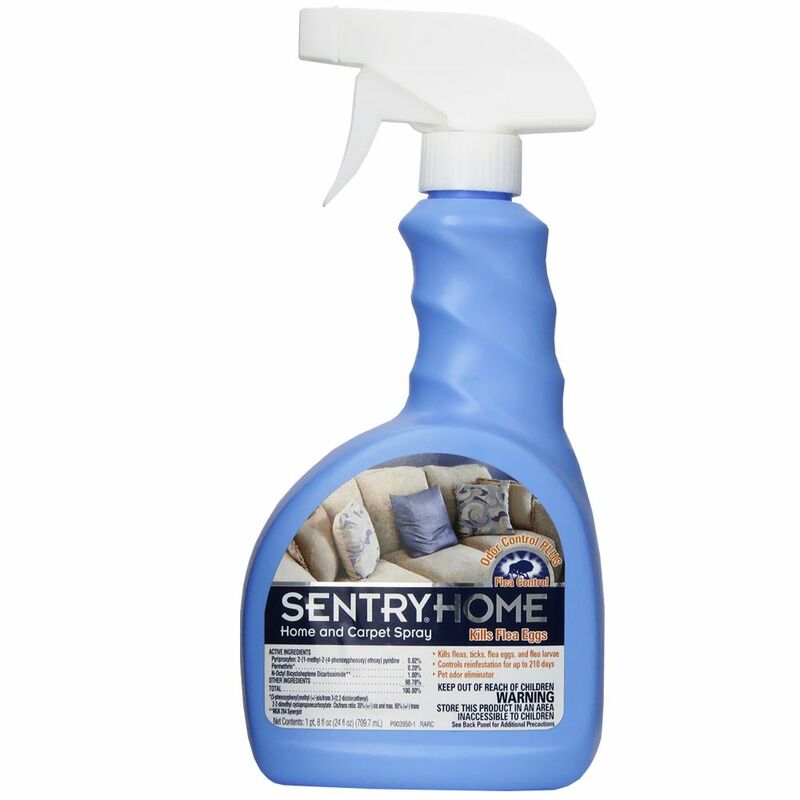 SentryHome Home & Carpet Flea & Tick Spray protects your home from fleas while eliminating pet odors! 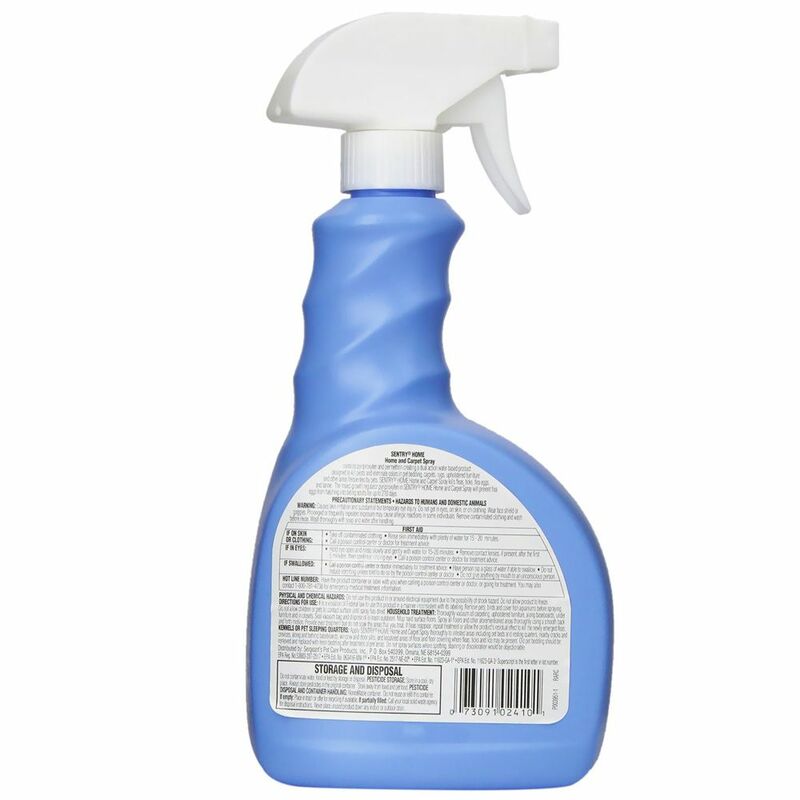 This easy to use spray kills fleas, ticks, flea eggs and flea larvae, protecting your home from reinfestation for up to 210 days. It also removes pet odors from pet bedding, carpet, rugs, upholstered furniture and other areas. Household Treatment: Thoroughly vacuum all carpeting, upholstered furniture, along baseboards, under furniture and in closets. Seal vacuum bag and dispose of in trash outdoors. Mop hard surface floors. Spray all floors and other aforementioned areas thoroughly using a smooth back and forth motion. Provide even treatment but do not soak the areas that you treat. If fleas reappear, repeat treatment or allow the product's residual effect to kill the newly emerged fleas. Kennels or Pet Sleeping Quarters: Apply thoroughly to infested areas including pet beds and resting quarters, nearby cracks and crevices, along and behind baseboards, window and door sills and localized areas of floor and floor covering where fleas, ticks and lice may be present. Old pet bedding should be removed and replaced with fresh bedding after treatment of pet areas. Do not spray surfaces where spotting, staining or discoloration would be objectionable.